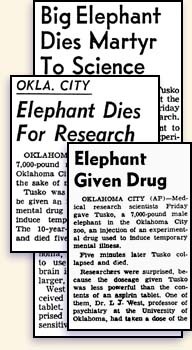 Psychiatrist Louis Jolyon West examines the results of his work — a dead 7,000-pound Tusko, killed with LSD not long after West took the drug himself. Articles in this edition describe some of the life-destroying effects of psychiatry’s primary therapies — drugs and electric shock. The following presents one of their chief advocates — Louis Jolyon West, director of the UCLA Neuropsychiatric Institute until his resignation following exposure of possible violations of federal law regarding use of government funds. 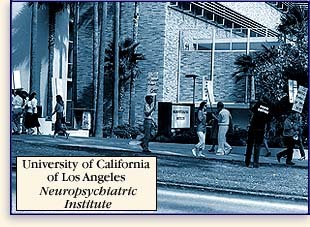 n a lawsuit currently before the Los Angeles Superior Court, it has come to light that the University of California at Los Angeles and UCLA Medical Center have, since the early 1980s, attempted to remove psychiatrist Louis Jolyon West from the roster of the university’s faculty. One psychiatric colleague who asked to go unnamed described West as “supremely arrogant” and charged that he “misused his positions for his own ends,” at the expense of the university. Many will not find such statements surprising, considering West himself, whose history includes controversial LSD experiments for the Central Intelligence Agency and even more controversial plans to construct secret installations for the “study” and modification — by electric shock, chemical castration and other means — of the behavior of citizens, particularly minorities. Indeed, any discussion of CIA “mind-control” endeavors, such as the infamous MK-Ultra, would be incomplete without West, who has, according to information provided to Freedom, enjoyed a long and lucrative career in this field. Although he has sometimes posed as a civil libertarian, he has not sought to expose dangers of intelligence agency “mind-control” techniques, but rather to secretly perfect its use on others. In a document released under the Freedom of Information Act, for example, it was revealed that more than four decades ago, the CIA sought to set West up in a clandestine laboratory to perform “mind-control” experiments with hypnosis and LSD. A portion of the experiments with LSD and other drugs in which West was enmeshed at the CIA’s behest were exposed in the mid-1970s by the U.S. Senate Select Committee on Intelligence, chaired by Senator Frank Church. West contributed to the early work which resulted in, among other things, the death of tennis pro Harold Blauer in an experiment with a mescaline derivative in New York City in 1953. The Senate Select Committee’s investigation revealed drugging of unsuspecting targets, electric shocking to obliterate memory and “programming” individuals to kill — acting under psychiatric control. 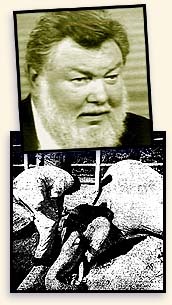 West’s career highlights included injecting a 7,000-pound bull elephant, Tusko, with an overwhelming dose of LSD — roughly 1,435 times the quantity, in West’s own words, one would have given to a human “to produce for several hours a marked mental disturbance.” Not surprisingly, the elephant collapsed in agony minutes later and died. West had ingested the mind-altering substance himself shortly before killing Tusko, the prize of the Oklahoma City Zoo, and was evidently still under its influence at the time he sloshed through the beast’s entrails, performing an “autopsy” which he recorded on film. He later issued a report to advance his “discovery” that elephants could be killed with LSD and to promote use of the drug to cull elephant herds in Africa. In the 1960s, West could also be found in the Haight-Ashbury section of San Francisco, conducting more LSD experiments, this time within the hippie community. A pet project of West’s in the late 1960s and early 1970s was the Center for the Study and Reduction of Violence. He proposed to establish a “securely fenced” center at a remote, abandoned Nike missile base in the Santa Monica Mountains, in keeping with earlier plans by the CIA to set up “mind-control” stations off the beaten path, where experimentation could be carried out free from such concerns as human rights. Ironically, West embarked on a PR campaign to promote himself as a champion of “human rights” — an effort that would be comical if not for the bottom line in terms of human suffering. West’s plans for such centers were the subject of hearings by the U.S. Senate Committee on the Judiciary in 1974, chaired by Senator Sam Ervin, whose members were alarmed at reports that West planned to test radical forms of behavior modification — mind-bending drugs, electric shock, implantation of electrodes in the brain and forcible castration with the drug cyproterone acetate. Critics charged that his violence centers would target blacks and Mexican-Americans in its studies. Other sites selected for West’s violence centers in California were Vacaville, Camarillo and Atascadero state hospitals. It has been documented that CIA drug and radiation experiments did take place at Vacaville. Yet another study that West called for was clearly aimed at intelligence agency application: remote monitoring and behavioral control. His plan was to use electric shock and other means to remotely control human behavior by computer. Many millions more poured into the controversial UCLA Neuropsychiatric Institute that West headed, including over $14 million in federal funds in one fiscal year before he stepped down. West has continued to advocate psychiatric drugs to treat virtually everything, holding that “clinging to the drug-free state of mind” is an “antiquated position for anyone.” Indeed, the unspoken thrust behind his career has been the control of individuals and whole populations through covert means. Between 1974 and 1989, West received at least $5,110,099 in grants from the federal government, channeled through the National Institute of Mental Health (NIMH) a major funding conduit for CIA programs. Before stepping down as director of the Neuropsychiatric Institute, West reportedly allowed psychiatric “treatments” that were more suited to brainwashing, “mind control” or a torture chamber than for resolving mental troubles. It was reported in 1976, for example, that Neuropsychiatric Institute psychiatrist Ivar Lovass had used electric cattle prods for “aversion therapy” on children. Lovass — hired by West — also allegedly shocked 5-year-old twins to “modify” behavior, with jolts administered through a grid system in the floor that enabled the psychiatrists to blast the children wherever they moved in the room. Despite the violence that marked the work of West and his cohorts, or perhaps because of it, he enjoyed influence in the psychiatric community, serving for example on the National Advisory Council to the NIMH. From his positions, he could have charted a far more humane and helpful course for mental health, rather than brain-damaging drugs and electric shock. As part of his legacy, the NIMH continues to squander billions in taxpayer dollars to fund research on brain-damaging substances, rather than genuine cures. The true cost — impossible to measure in money — lies in the Americans now dead from psychiatric drugs and electric shock or, still living, existing as little more than vegetables. The secrecy and false information that for decades cloaked West’s activities continue to shroud the effects of the treatments he promoted and which are still in use. And today, the living hell that Melissa Holliday experienced still exists for nameless others you probably won’t read about in the press. 1. Warfare as planned and conducted by modern intelligence agencies.